With the lockout doom-- DOOOOOOOM-- it's probably for the best that the actual NHL fans actually get acquainted with some other leagues out there. Yes, that's right, folks-- there's other hockey leagues out there besides the NHL. Crazy, I know. So, here we go. While it is one of the youngest and least known leagues-- the history of the Southern Professional Hockey League is an interesting one at best. It came together after a division of the Southern hockey contingency which was bound to ruin the whole landscape for those markets for other leagues. 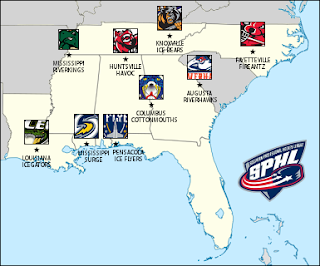 The SPHL came from the remaining teams in the South East Hockey League and the World Hockey Association 2, which were competing leagues in the Southeastern US during the 2003-04 season and both of those leagues were spawns of the Atlantic Coast Hockey League, which ran during the 2002-03 season. After both the WHA2 and SEHL failed (WHA2 because of a cease-and-desist from the failed new WHA and SEHL only have four teams and two of them fold), the SPHL came together with eight teams coming into the league-- two from the SEHL (Fayetteville FireAntz and Knoxville Ice Bears), one from the WHA2 (Jacksonville Barracudas), and one dropping down from the ECHL (Columbus Cottonmouths). Along with the Huntsville Havoc; Fayetteville, Knoxville, and Columbus still remain as the originals. Currently, the SPHL has nine teams in seven states across the Southeast, in what could be considered "single-A" hockey in terms of the minor league system. This is a place where you would see many veteran minor leagues drop down to play in their later years and young college kids-- probably from D-III or club team schools-- would go to play to continue their pro dream or stay there to live it out. However, one of the big catches for the SPHL-- DIFFERENT RULES!! If nothing else, the SPHL does bring to light the renegade hockey level of play for the fans that are down there. Yet, while the SPHL does have it's niche; they have been in some areas where it hasn't worked, failing twice in Winston-Salem, NC; once in Richmond, VA (a former ECHL hot bed); as well in Orlando and Jacksonville, Florida. There have been some economic short-falls (which is something that is common with minor league hockey), but the SPHL has made some solid expansion decisions with former minor league hot-beds like Augusta, GA; Pensacola, FL; Biloxi, MS; and Lafayette, LA. It's not well-known or well covered, but the support from the fans down there and the short scheduling is something that makes this a solid league to maybe get into-- especially for the Southern hockey fans needing their fix.